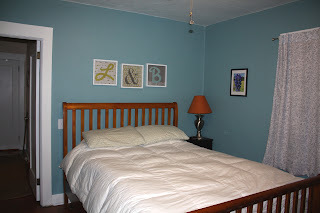 We thought a blue would be a nice choice to continue the color scheme of the front bedroom so we wouldn't have a rainbow house of disjointed colors but we also wanted something different enough to be unique. 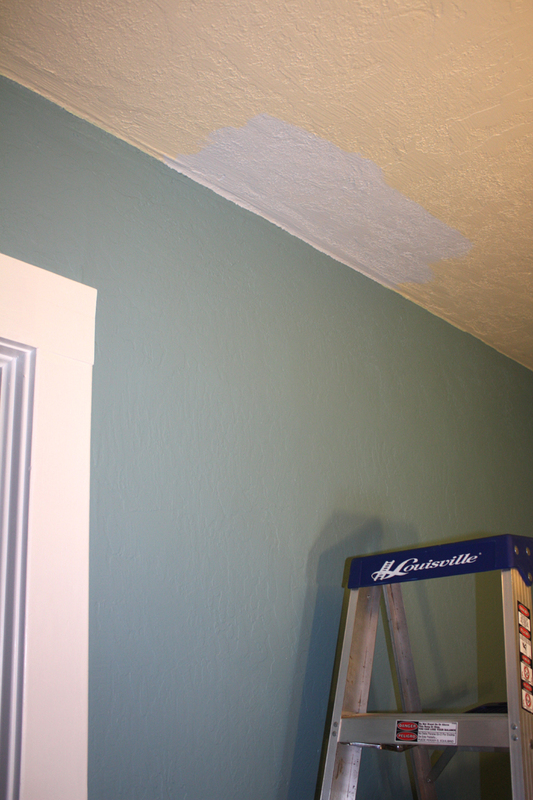 We ended up choosing the bottom blue shown called "Geyser" from the Martha Stewart Paint Collection. 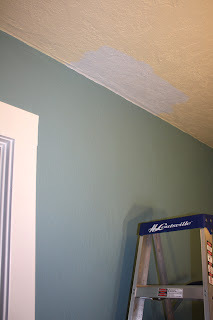 Excited that we finally made a decision on the color of the back bedroom (we had been living with splotches of mismatched paint on the walls for months!) 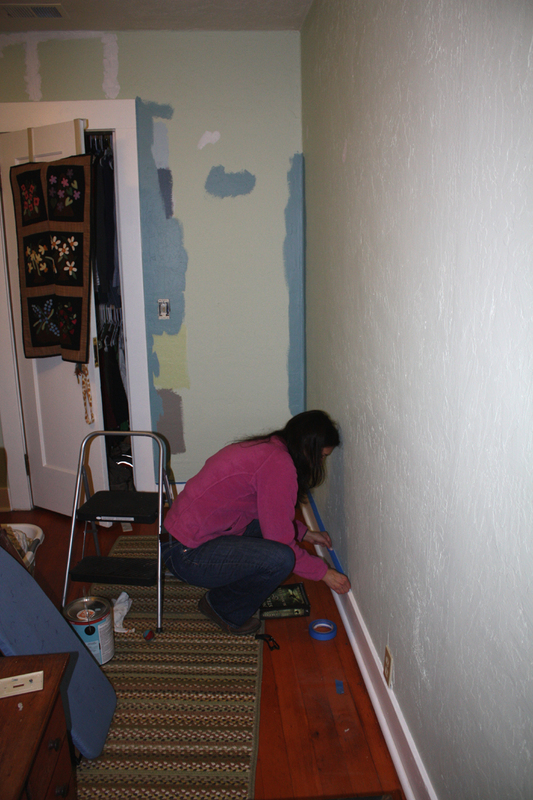 I got to work taping the baseboards and door/window frames. 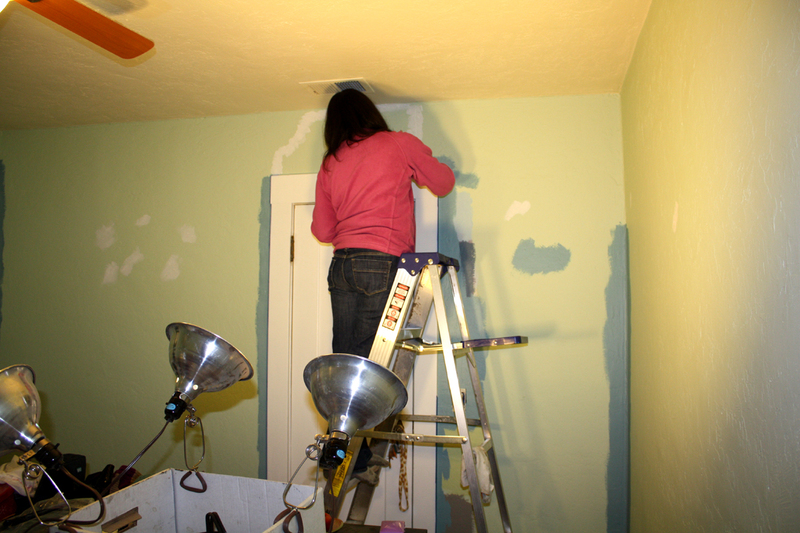 And then the tedious task of painting the edges :o( Brian helped out with the lighting, I was working in the spotlight. 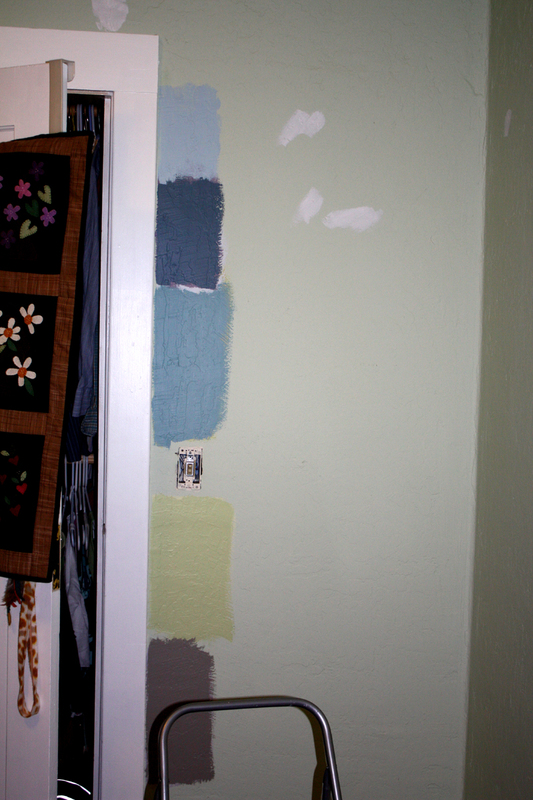 Back to Home Depot we went for another sample. One of the neat things about the swatches for Martha Stewart Paints are they also have suggestions for trim and ceiling colors. So we thought maybe Martha's people know what they are doing and we should just follow their advice and try a sample of their ceiling color recommendation. 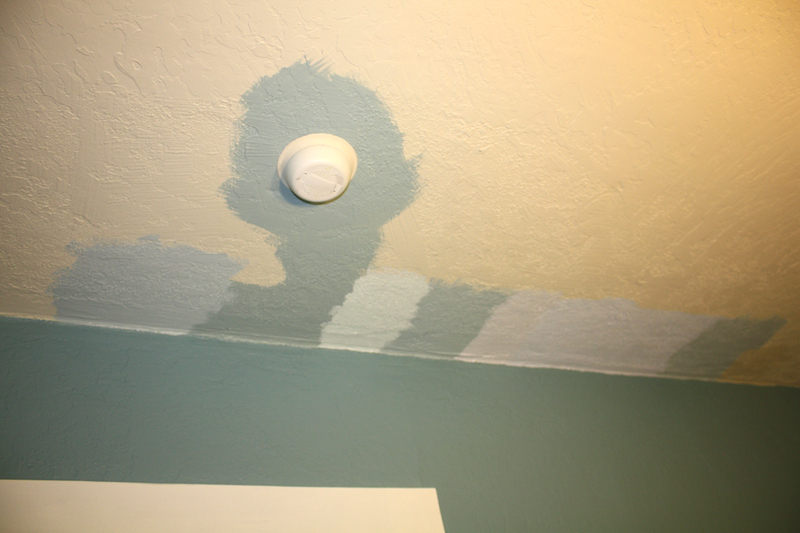 Ummm.............no, too dark. So once again back to Home Depot. So there were new samples bought and also me trying to mix paints because I had already bought a gallon of the initial paint I thought would be perfect :o( Once again we had a splotches of paint trials, this time on our ceiling. 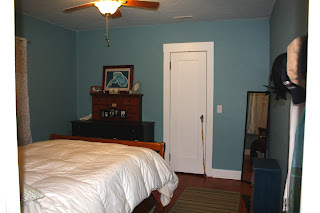 We ended up choosing a color similar to the first sample we had tried but with a bit more blue to keep the room from feeling to heavy with a darker color. And here we have pictures of the FINISHED! 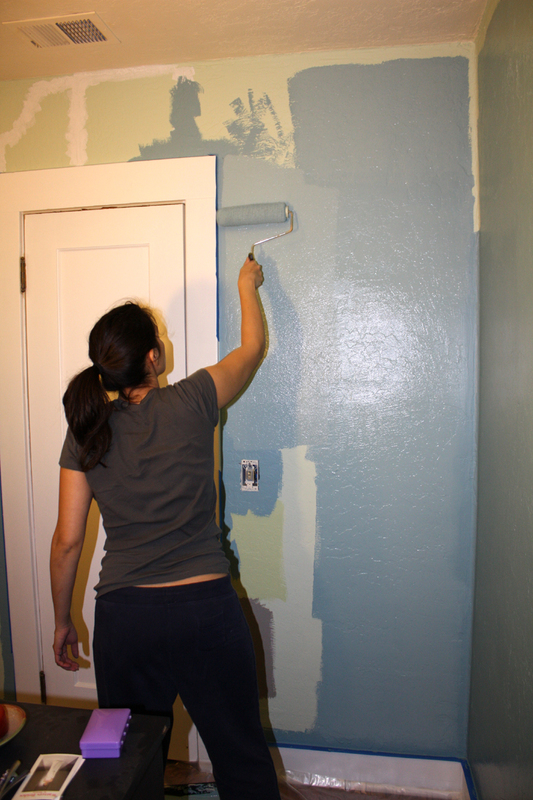 freshly painted room. 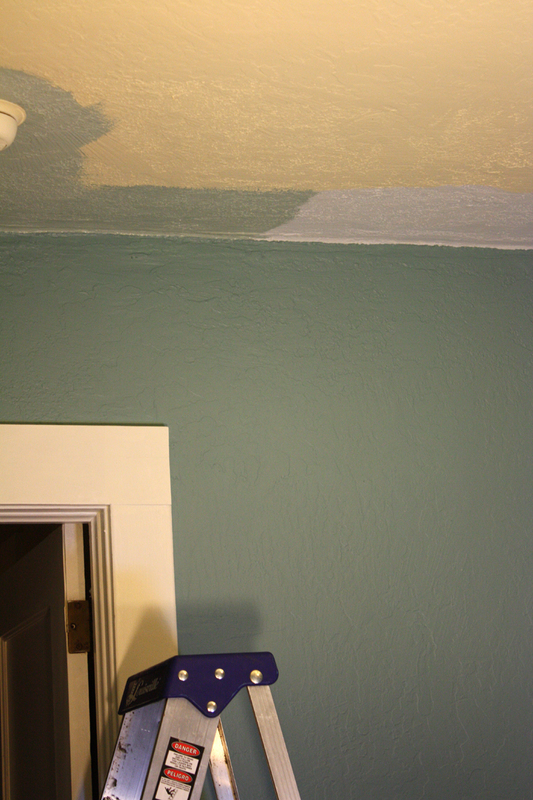 We still have some work to do like the crown moulding sometime down the line and just changing some of the decor over to fit the new color scheme. Overall we really like the blue and it makes the white trim and the wood floors really POP! 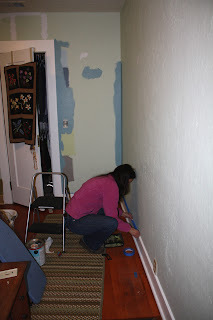 More furniture painting, my new favorite pastime!